Do you find yourself turning to food without thinking? Do you use food for comfort when you are feeling bad? Are you overweight and unable to lose those pounds when you go on a diet? You may be addicted to food and of all possible addictions, it can be one of the most difficult to break because food is necessary to live. You don't have the option of simply giving up food and never touching it again as you would if you were addicted to tobacco, alcohol, or drugs. The problem is that if you have an addictive personality, it is entirely possibly to become physically addicted to food. 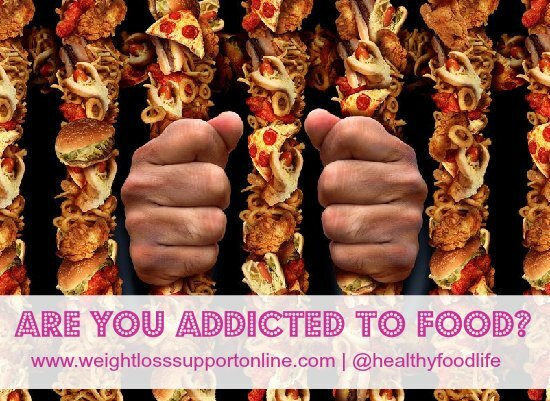 How To Tell If You Are Addicted To Food? Sometimes it is hard to distinguish food addiction from a simple lack of control, but they are not the same thing. Where there is lack of control in food addiction, there have been studies wherein people's brains were examined with a magnetic resonance imaging (MRI) machine. When a food addict was asked to think about a certain food, his brain lit up in the same way a drug addict's brain does so when thinking about drugs. For a few days, write down all the food you eat, including where and when you ate it, anyone you were with, and how you felt before and after you ate the food. Keeping this journal will help you become aware of any eating patterns; until you are, it will be difficult to change what you eat. In the same way that a drug addict needs to stay away from certain people when he is in recovery, you may need to avoid certain people or situations until you have your eating under control. Notice how you are eating your food. Are you rushing through a meal? Are you watching television or reading while you eat? This is mindless eating and it is part of the problem. You need to slow down and pay attention to your food. Make a new habit of slowly savoring every bite of your food. By studying your journal, find out what triggers your food addiction and then avoid them. Do you find that if you go to a baseball game, you eat hot dogs and drink beer without paying attention to how much you are consuming? Or do you give yourself a pass when you go out to a restaurant, and eat anything you want? Maybe it would be better to avoid baseball or eating out until you feel you can control your eating. Yet, most addicts of any type will tell you that abstaining is not the same as ridding yourself of people, places and things related to the addiction. If your trigger is something more personal than a place or thing, maybe from devastating circumstances, then it may be that you need to seek professional help in working through the issue(s) at the bottom of your food addiction. Mindful Eating is an important change. If you find that you are only eating foods that bring you comfort rather than what is nutritionally healthy for you, you are sabotaging your efforts to get over your food addiction. It will help if you take a moment to think when you feel the urge to eat. Are you really hungry? If you aren't, then you should not eat. If you are hungry, then remember to eat to feed your body well. This may sound like an impossible task, but the more you practice making healthy food choices, the easier it will be. Eventually, you will even find yourself craving those healthy foods. When that happens, you will know that you've finally gained control over your eating. Learn, Share, Grow With Friends! Please feel free to click the Message button on my Facebook page to request friendship and membership in our support group.